Gold markets were rocking on Tuesday, lifted by a basket of factors that included poor stock market performance earlier in the week, slow growth in China, weak earnings reports and expectations the US Federal Reserve would strike a dovish tone at its two-day meeting starting on Tuesday afternoon. The Fed raised interest rates four times in 2018 but some officials have signaled they are not expecting to continue raising rates this year, as the US economy faces a number of pressures including the ongoing trade war with China, the US government shutdown part 2 and waning consumer and business confidence. Indeed the doves were firmly in control on Tuesday as spot gold rocketed past $1,300 an ounce to close at $1,311.66 in New York - a 7-month high. Strength in the precious metal was buoyed by rising US-China tensions after the Justice Department charged Chinese tech company Huawei and its chief financial officer (earlier arrested and held in Vancouver) with fraud, thus escalating trade tensions that have been ongoing for almost a year, with billions in import tariffs levied from either side. The US dollar index, which typically moves in the opposite direction of gold, was near a two-month low, Tuesday. At Ahead of the Herd we love gold (and promising junior gold companies) because gold holds its value through time. Owning gold is a way to preserve wealth against paper currencies which are subject to inflationary pressures and over time, lose their value. In the US there was an increase in inflation for every decade except the Depression when prices shrunk nearly 20%. Between 1860 and 2015, the dollar experienced 2.6% inflation every year, meaning that US$1 in 1860 was equivalent to $27.80 in 2015. This also means that prices in 2015 were 2,828% higher than they were in 1860. We also like gold because gold companies and explore-cos are finding less of it. All the easiest gold to mine has been found, including gold found near surface and in underground veins. We are now facing “peak gold” where gold production from here-on will keep falling. The experts agree the industry is seeing a significant slowdown in the number of large deposits being discovered. It used to be that major gold miners were looking at 5-million ounce projects to buy and develop; now they’d be happy with a million ozs in the ground. Taking a run through the headlines, we find everything is in place for a big run-up in gold. The US dollar was on the rise last year, causing gold to fall, but this year the dollar is struggling, weighed down in part by the US Federal Reserve’s signal that it may stop raising interest rates and unwinding its balance sheet, put in place to keep tightening monetary policy. The central bank since October 2017 has been decreasing the size of its $4.5 trillion debt by allowing $50 billion to run off each month. We are also looking at slowing global growth, a worsening US economic outlook, the size of the federal debt, the Fed possibly lowering interest rates to stimulate the economy, and a rush to safe havens like gold due to escalating conflicts. Let’s take each in turn. When economies falter, gold tends to well. The big news here is China, whose economy was booming at double-digits for most of the 2000s but is now creeping along at just 6.5% in fourth quarter 2018. This is a normal expectation from a country that moved very rapidly to becoming an export-driven economy, with a low-value currency, to a more diversified one now. However there are worrying signs in China about slack consumer spending on discretionary items like cars and phones - Chinese imports fell 7.6% in December after gaining 16.1% in 2017. 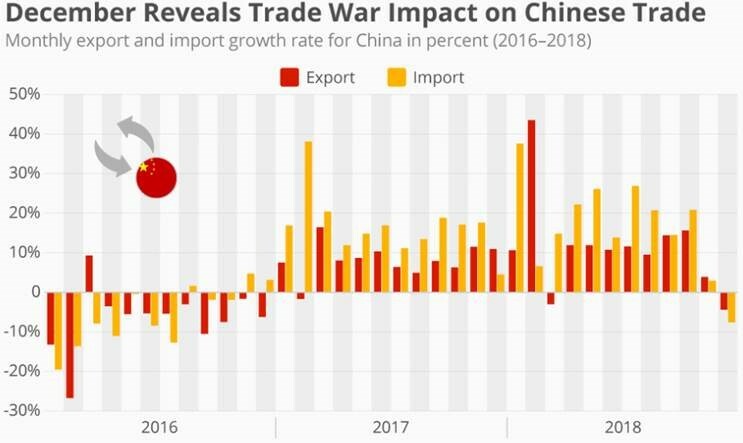 Exports are also hurting, due to US tariffs on Chinese goods. Following a crisis-induced plunge of 10.4% in the volume of global trade in 2009 – a modern-day record – recovery has been muted. After a brief two-year rebound in 2010-2011, world trade growth averaged just 3.6% from 2012 to 2018 – about half the 7.1% average annual pace in the 20 years before the crisis. All in all, the global trade cycle is facing major stress in 2019, and markdowns have only just begun. This underscores the risks of a major shortfall in world GDP growth. Emerging markets better hope that the Fed does move in a dovish rather than hawkish direction, by keeping rates low. According to Fitch Ratings, Latin America, the Middle East and Africa will face more downgrades than upgrades to their debt ratings this year, if interest rates and the dollar rise. That’s because these countries’ currencies have depreciated and they have a high share of their debt denominated in foreign currencies. Examples are Turkey and Argentina. As the worst-performing emerging market currency last year, the Argentine peso has 83% of its government debt in foreign currency, Bloomberg reported, making it especially vulnerable to a dollar rise. 47% of Turkey’s debt is foreign; the lira fell 28% last year. President Donald Trump took credit for the stock market run that prevailed for most of the last two years since his inauguration in January 2017. The continuation of the longest bull market in American history had even Trump’s opponents conceding things were going well, until the market encountered a serious correction last September. December was the worst month for US stock markets since the Great Depression, and while markets are up since the start of the New Year, investor sentiment is weak and despite the economy barreling along at near full employment, and inflation at a very reasonable 2%, many economists are urging caution ahead. If there is a meltdown, like the housing market collapse that pre-dated the financial crisis, or the sudden shock of understated earnings that burst the dot-com bubble, expect gold, the time-honored safe haven, to rally. Beyond the stock market, there are other signs that all is not well in the land of the free. As corporate earnings start to trickle in, it’s not looking good. On Monday Caterpillar, a heavy equipment manufacturer, and Nvidia, a chipmaker, both reported lower-than-expected fourth-quarter earnings due to weakness in China. Caterpillar, the world’s largest maker of construction machinery, is seen as a bellwether of US economic health. Then there’s the debt bogeyman. According to the Congressional Budget Office, as the stimulative effects of Trump’s tax cuts wane, the increasing federal deficit - projected at nearly $900 billion - will weigh on growth. Reuters reports the CBO saying that economic growth will slow to 2.3% from 3.1% in 2018. More alarmingly, whereas in 2007 total government debt was about $9 trillion, 62% of GDP, now it is approaching $22 trillion, 100% of GDP. Corporate debt is at a record 46% of GDP. This isn’t just an American phenomenon, though, it’s global. After the financial crisis, central banks in the US, Europe, China and Japan all lowered their interest rates in an effort to stimulate borrowing, and economic activity. They also injected massive amounts of liquidity into the system (aka printing money through quantitative easing). Just over a year ago the Fed started removing liquidity (Treasuries and mortgages) to try to reduce the multi-trillion-dollar debt it had accumulated through QE; in 2018 it raised interest rates four times. And why not? The US economy was running hot, with no signs of problematic inflation, and a healthy stock market. China and Europe also made moves to deleverage their debt. The massive build up in global debt that the central government sought and encouraged developed with interest rates at unprecedented lows. That means borrowers are exceptionally sensitive to increases in interest rates and decreases in the availability of credit. After a decade of ultra-loose monetary policies designed to encourage debt it isn’t surprising that the world has gorged on it nor that, now that the central banks are starting to reverse course, markets and their participants are becoming nervous and more risk averse. Given its $22 trillion debt, can the United States afford to raise rates any more, with the pain that this higher cost of borrowing will entail? Long-time Fed critic Peter Schiff doesn’t think so. 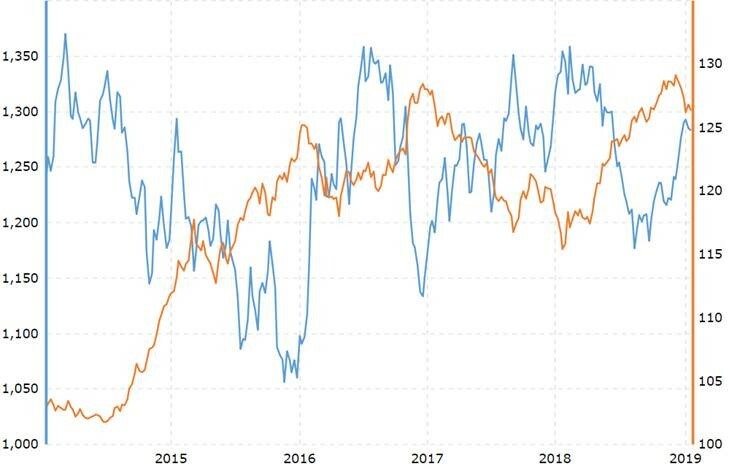 Schiff, the CEO of Euro Pacific Capital, thinks with debt levels so high, the only way to finance it is to keep interest rates at ridiculously low levels. “Everybody thinks that quantitative easing is over. What they don’t realize is it’s barely begun. The next round is going to be bigger than the first three, and that’s going to send gold to new highs,” Schiff said at the New Orleans Investment Conference. On Tuesday, Ronald-Peter Stoeferle, fund manager at Incrementum AG and author of the In Gold We Trust report, told Kitco News he isn’t surprised to see the central banking getting more dovish; he agrees with Schiff that rates are likely to come down. Another disturbing trend in the American economy that few people talk about is its growing inequality. Why is that important? Because as more people grow poorer, fewer can participate in the economy, like borrowing and spending money. A study by the Economic Policy Institute found that in 2015, five states, 30 metro areas and 78 counties exceeded the previous national record for share of income by the richest 1%, at 23.9%; the previous record was set in 1929. The incomes of the top 1% grew faster than the 99% between 2009 and 2013. The 1% in 2015 had average household income of $421,926. This was exceeded by 13 states plus Washington DC. There has been slow wage growth in almost every part of the country, over the past 45 years. The US has more poor people than Sierra Leone and Nepal. 5.3 million Americans are living under the poverty line, including several million children who live on less than $2 a day. The effects of this growing inequality in America is especially felt in urban areas, where lower-income residents and marginal businesses are being squeezed out of neighborhoods. We see the same thing in Vancouver - it’s a kind of reverse gentrification, where only the top 10% can afford to live there. If and when a recession hits, these 10%-ers will be hard hit. Businesses highly dependent on discretionary income, like expensive coffee shops, will go under. “In effect, the top 10% is ripe for the disruptions of globalization and automation that have already laid waste to the bottom 90%,” writes Charles Hugh Smith, a blogger. Along with the conflict over Huawei, Tuesday’s gold rally was also underpinned by the return of safe-haven demand, particularly with respect to US tensions with Venezuela and Russia. On Monday the US sanctioned Venezuela’s state oil company, the boldest action taken so far in the effort to isolate embattled President Nicolas Maduro. The measure blocks about $7 billion in assets. The Trump Administration last week recognized Opposition leader Juan Guaido as the interim president, and has called on the Venezuelan military to get Maduro to resign. The country has been gripped with hyperinflation, soaring unemployment and a mass exodus of refugees, CNN reported. It also looks increasingly likely that the US will pull out of a key nuclear disarmament agreement signed in the 1980s. NATO’s 29 members are urging Russia to destroy a nuclear-capable cruise missile system before Feb. 2. Failure to do so will put the US government on track for a threatened pull-out of the 1987 IMF Treaty. We have argued the breakdown of the IMF Treaty could be the catalyst that starts a new arms race between the United States, Russia and China as each projects military power in defense of spheres of influence outside their borders. We are seeing this in the constant tension between the US and China in the South China Sea and Taiwan - which China claims as its own - and Russian expansion into the Ukraine and military support for Syria. While no-one want to see the return of the nuclear threat, if events escalate, gold’s safe-haven status will kick in and we will see upward price pressure. 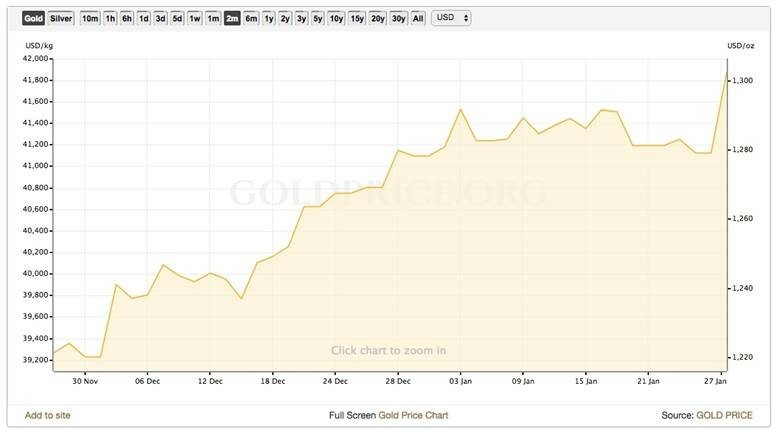 Given that gold always pushes against the prevailing economic winds, it appears likely that we could be in for an extended upleg in the price. We are only now seeing the rot that has begun to set into the US economy. The first clue was the stock market correction, but others are coming forward. As Trump’s $1.5 trillion tax cuts announced at year-end 2017 finish percolating through the economy, growth is predicted to stall. We are already seeing disappointing corporate earnings, especially from companies that sell into China, which is also slowing down. The trade war isn’t helping. Unemployment is low, but this is misleading. Many Americans are working dead-end jobs or are employed part-time. The gap between rich and poor is widening. Most importantly for gold, the tightening cycle appears to have stalled. With record debt on the books, the central bank has very limited leeway in how fast and far it can raise interest rates. If we are heading into a recession, as some predict, the Fed may have no choice but to once again lower rates to stimulate the economy, as it did in 2011. Bad economic times ahead means good news for gold and gold stocks.